One of the most difficult things for a bowler to do is visualize the ball path from the foul line to the breakpoint. From entry level bowlers to the most advanced, the Torch allows bowlers to see the initial path of the bowling ball like no other product before. Read more about the Torch here. Battery lasts 5-6 hours when fully charged. 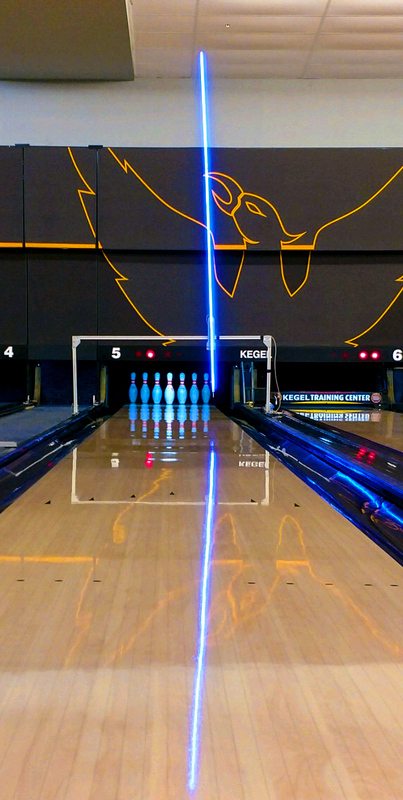 The Kegel Torch is a simple light targeting tool that be installed in bowling centers to help bowlers with accuracy and alignment. This video shows how easy it is to set up and install the Torch on a bowling lane. Watch the below videos for more information about the Torch. One thing all great bowlers do is manage the way their ball exits the oil pattern and throughout the breakpoint. With the Kegel Torch you can see these two critical areas like never before. The Kegel Torch helps bowlers of all skill levels with their alignment to the oil pattern exit point, the break-point, or even specific spares like the 7-pin or 10-pin. To purchase the torch, Please contact a Kegel Distributor: USA & AMERICAS, EUROPE, ASIA.